After a run heavy fall where I barely touched my bike, I’ve turned a page over the past month and have been gradually ramping up my bike training. 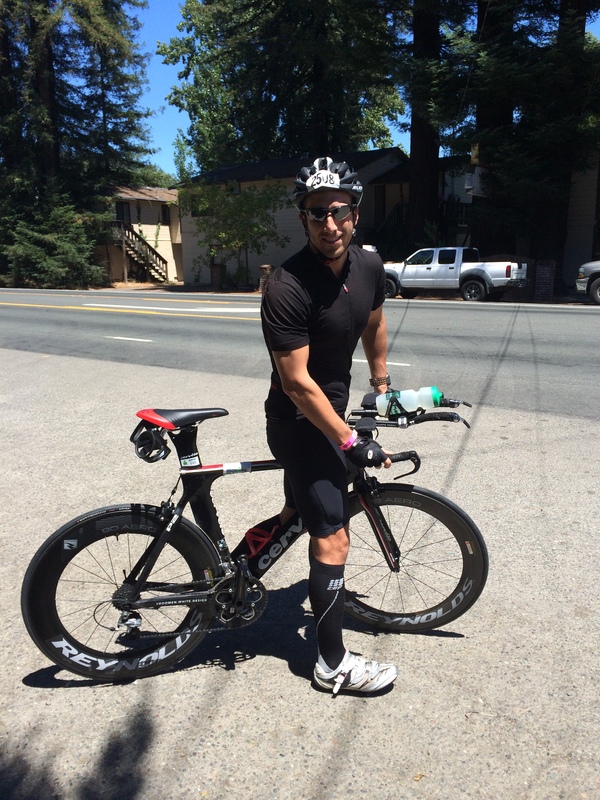 I have a lofty goal this year – I want to ride a sub-2:35 bike leg at Vineman 70.3 in July (56 miles), and building a strong early-season base is a crucial aspect of my training this year. Taylor and I have consistently attended spin class since we joined the Bay Club in July, however I’ve recently started riding on the CompuTrainer at Shift – a local cycling studio, along Breakaway Performance – the Bay Club’s endurance sports arm. I’ve really enjoyed riding on the trainer, however it’s a much different animal than riding outside. 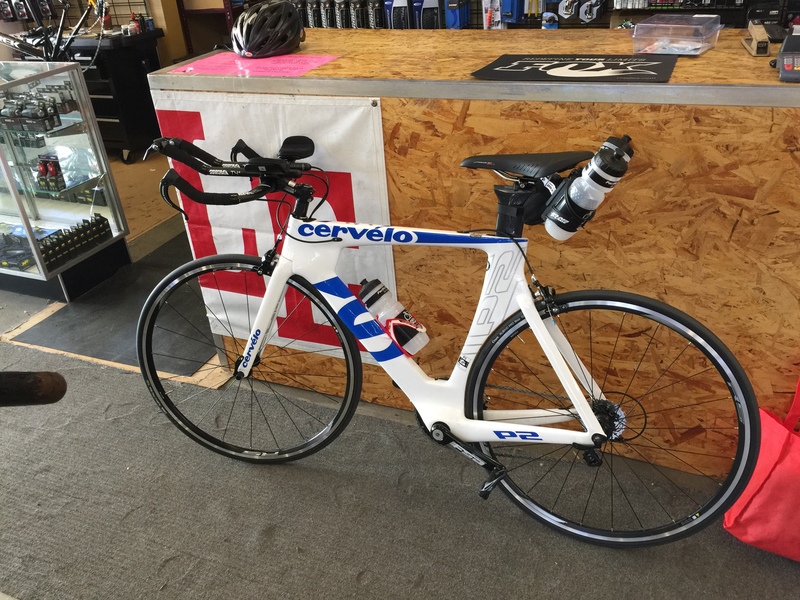 Here are some of the things I would recommend for indoor rides – especially on the trainer. 1. Prepare to drink. A lot – When I ran into Taylor halfway through my trainer session on Saturday, I looked like I just got out of the pool. Between the studio temperature, ventilation, body heat from the class, and your own exertion, you will sweat – a lot. Follow the same hydration plan that you would on a hot day of road riding: for me, that means ample Skratch (electrolyte drink) and plenty of water. I easily put down 2 bottles per hour. 2. Focus on pedal stroke – Use the trainer as an opportunity to work on building a strong pedal stroke. Unclip and practice with each leg individually – the trainer will help expose “dead zones” where your power is lacking. Over-exaggerate pushing with your quads and dragging with your hamstrings and hip flexors. Alternate between low and high cadence until you get it right. 3. Ride at your own pace – Much like a race setting, resist the temptation to hammer despite what others are doing around you. I’ve found that I sometimes have a hard time holding back on the trainer, but it’s important to liken a group training session to a group ride outdoors – minus the visible separation in the pack. Unlike road riding, there’s no such thing as coasting on the downhills, so fatigue builds quickly. There’s no shame in deviating from the class – whether it’s dropping the intensity or adding more gear – to maximize your workout. 5. Assume the position – Whether you’re riding in the aerobars on your TT bike or learning how to ride in the drops on a road bike, use the trainer as a way to practice the position you want to be in on the road. You don’t have to compete with cars or worry about the road conditions – dial in on your ideal position and practice before you hit the road. I love reading about your training. You really put your all into it. So impressed by your goals. I still have yet to get the courage to go to a spin class. But I am going to sign up for swim lessons. Look out! Nice post brother. Good luck on that 2:35, that’s a fairly lofty goal right there. So glad that you are back “on the saddle”!! Great tips! I think the trainer is an awesome way to really work on your cycling in the winter/off season. I always feel stronger when I go back outdoors after I have had months of trainer sessions! You will definitely rock the 2:35 in July and be that much closer to the sub 5!! When I was into triathlon I would train on my trainer, listen to Ultra Runner Podcast and just pedal for hours! Never did it in a group setting though. Good pointers! We don’t have spin classes up here currently and I really miss that. My bike is downstairs on the trainer in front of the television. Not quite the same as a class. Bicycling is so foreign to me, it’s always interesting to read about your experiences. I’ve finally signed up for classes at a local spin studio (spinning and yoga) but I have yet to take a spin class… I think I’m nervous! I know once I’ve gone once all nerves will be gone, but sometimes it’s hard to take that first step. I learned the hard way about hydration and biking. I’m using to go for my workouts (walk) for 2 hours no water, laster year while I was injured and couldn’t walk, I started biking. I biked for 2 hours, no water, got home I was feeling horrible, dizzy, headache, sick of my stomach. I was dehydrated all the way. I’be never biked indoors though. I’ve never really been a biker – I still have to go to a spin class but I’m hoping to switch over to bike commuting once the weather warms up a little. I’ve never even thought of my pedal stroke – how interesting and something I can definitely work on. Great advice and good luck with your racing objective.